And a bit about Yankee Stadium. 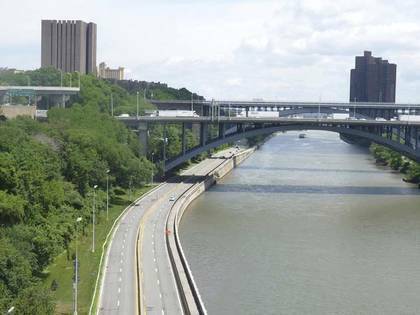 The multi-million dollar rebuild the city accomplished for The High Bridge, which connects Washington Heights in Manhattan with Morris Heights in the Bronx, is a capstone for restoration activities in the Harlem River area. 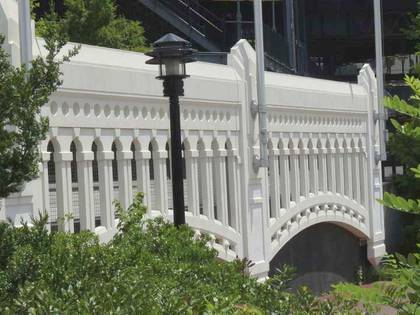 Over the past decade, the city has installed a new Willis Ave. Bridge, as well as painted and cleaned up other crossings like Macombs Dam and University Heights. In addition, it took over three years, but the Brush Staircase connecting the Harlem River Dr. and Edgecombe Ave., one of the last tangible remains of the old Polo Grounds, was also restored and reopened after years as a rusted ruin. A walk or jog up the steps is perfect cardio workout. I took the A train to 175th St. and walked from there to Yankee Stadium, a task made eminently easier with the reopened High Bridge. Here’s a bit of what you can see along the way, beginning with the former Loew’s 175th St. Theater on Broadway. Going back to the silent era before 1927, movie houses were built as extravagant palaces, as a means of taking people away from mundane circumstances into a different, better world, especially after the country was plunged into a depression through most of the 1930s. The Loew’s 175th opened February 22, 1930 and originally seated over 3400 people. The exterior presents as a Middle Eastern fortress of showbiz, with Indo-Chinese ornamentation. The foyer features a palatial staircase leading to a grandiose, aurora borealis headed by a goddess decoration, all in the style of a gaudy Hindu temple. After the theater closed in 1969 (the last feature was 2001: A Space Odyssey) it was the home for many years of the Christ United Church, founded by the charismatic preacher Rev. Frederick J. Eikerenkoetter II, better known as Reverend Ike (his bizarre “greed is good” message—he charged money for blessings—was a radio and concert staple in the 1970s). Though the church still owns the theater, now known as United Palace for the Arts, it has become a concert venue hosting concerts by the likes of Neil Young, the Allman Brothers, Beck, Smashing Pumpkins, Björk and many other acts. Movies have also returned in a limited fashion. Rev. Ike’s organization must be applauded for keeping most of its exterior and interior features intact. High Bridge Park runs along the Harlem River from W. 155th and Edgecombe Ave. all the way north to Fort George Hill and Dyckman Sts., and despite the efforts of entertainer Bette Midler, who has been trying to rehabilitate it along with the NYC Parks Department for several years, it stubbornly remains one of NYC’s more dangerous parks in spots. The park was assembled in pieces for nearly 100 years, as the city acquired various properties along the river; the last chunk came in 1967. 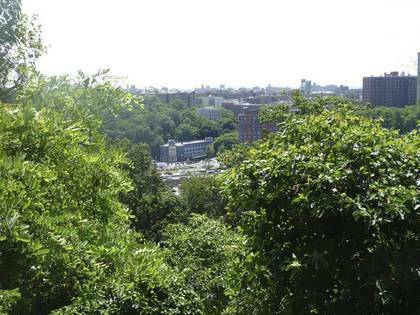 A path in Highbridge Park leads close to the Harlem River but the park is on a high bluff. From there, there are views east to the Bronx, but these are best seen in fall and winter when the branches are without foliage. The High Bridge water tower is a signal that the staircase to The High Bridge is close by. It was built by architect John Jervis a couple of decades after the bridge itself, 1872, and was used as a 47,000-gallon storage tank and as a water pressure equalizing structure. 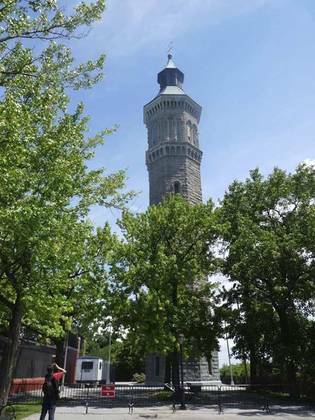 It has a winding spiral staircase inside whose climb rewards you with spectacular views of the surrounding Washington Heights, Harlem and Morrisania neighborhoods. The High Bridge is the oldest extant bridge in NYC that spans two boroughs, though it was built between 1838 and 1848 by architect John Jervis when the Bronx was still a southern extension of Westchester County. The High Bridge was actually the third bridge to cross the Harlem River: the original Kings Bridge spanning the river was built by the British in 1693 and the original Macombs Dam appeared in 1814; the present Macombs Dam Bridge, the third on the site, was built in 1895. While other Harlem River crossings look fairly uniform—they were designed by Alfred P. Boller, except for the new Willis Ave.—the High Bridge is a beast all its own, with a unique design. The High Bridge was built as a conduit to water to the city from the upstate Croton Aqueduct. Originally, the bridge featured massive stone arches (like Roman aqueducts had) for its entire length. The arches survive on the Bronx side, but the steel span was constructed in the 1920s to allow navigation on the Harlem River. Water was carried in two 33”-diameter pipes, later replaced by a more massive 90” pipe. 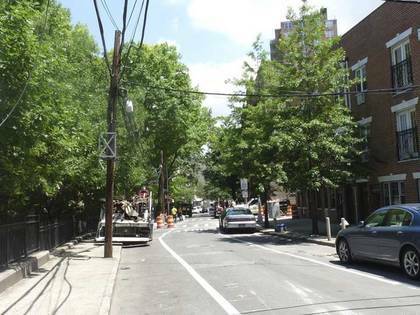 It was able to conduit as much as 24 million gallons of water per day. The High Bridge has always featured a walkway, although it never had roads for auto or horse traffic. Edgar Allan Poe, a Bronx resident toward the end of his life, enjoyed frequenting the bridge. 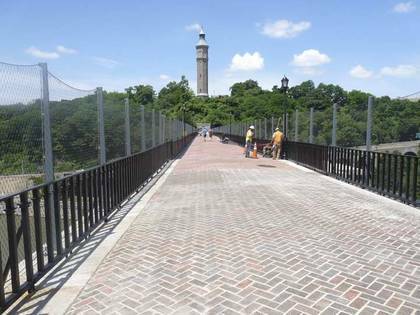 The walkway features attractive cast iron hand railings and interlocked red brick paving stones, along with views of High Bridge’s neighboring spans across the Harlem, the Alexander Hamilton and Washington Bridges. Looking north toward the Alexander Hamilton (foreground) and Washington (background) Bridges. The Hamilton connects the Cross-Bronx Expressway with the George Washington Bridge, while the Washington Bridge connects local traffic between W. 181st St. and University Ave., though there are also ramps from the Washington Bridge to the Cross-Bronx. Confused yet? The confusion comes from the decision to name the massive suspension bridge crossing the Hudson to Fort Lee, NJ the George Washington Bridge in 1931. The original Washington Bridge, without the George, was already in place, since it was finished in 1888. The George Washington Bridge’s original name in 1931 was the Hudson River Bridge, yet the Port Authority preferred to name it after the first President. 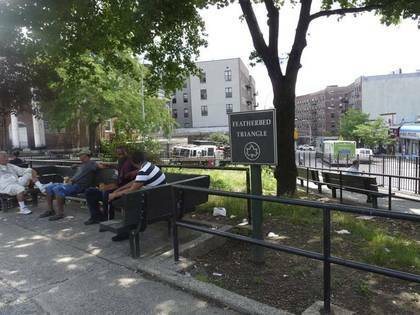 On the left is the Harlem River Dr., originally serving horses, carriages and wagons and known as The Speedway. It was reconstructed for automobiles in the early 20th Century. The east end of The High Bridge leaves you at University Ave. and W. 170th St. University Ave., named for the New York University campus now occupied by Bronx Community College (the Hall of Fame for Great Americans is on the campus) has three disparate sections: a quiet two-lane road from its southern end at Sedgwick Ave. north to the Cross-Bronx Expressway, then it’s a multi-lane behemoth north to Kingsbridge Rd., then a few more blocks of quiet before it peters out at the Jerome Park Reservoir. The stretch of University Ave. that The High Bridge lets out on was named Lind Ave. in its early years, possibly for 19th-Century singer Jenny Lind, the “Swedish Nightingale.” And, the northern end of the avenue was earlier Aqueduct Ave., for the Croton Aqueduct. New York City has weeded out most of its colorful names over the decades, such as the Bronx’ Bear Swamp Rd., Staten Island’s Skunks Misery and Gun Factory Roads and Queens’ Black Stump Rd. and Quarrelsome La., so I’m glad the Bronx still has Featherbed Triangle and Featherbed La., which runs in two pieces from Jerome Ave. west to Macomb’s Rd. and from Macomb’s Rd. and Grand Ave. west to University Ave.
Oddly the name doesn’t seem to be a colonial-era relic, since it begins appearing on maps as late as 1890. The late Bronx historian John McNamara floated several ideas about how the road got its name, such as Loyalists laying featherbeds on local lanes to muffle the British army’s hoofbeats; farmers upholstering their wagons with featherbeds on the rutted roads; or, during the construction of the Croton Aqueduct in the 1840s, prostitutes had a bang-up business from the local workers, on, you guessed it, featherbeds. The name was likely used informally for several decades and when the streets were laid out and built, Featherbed La. was included. It took about two years to completely tear down the old Yankee Stadium, which was built at River Avenue and West 161st St. in time for the 1923 season, the Yankees’ fourth with Babe Ruth; that year, they won the first of their 27 World Series. Finally, Macombs Dam Park and Heritage Field took the old Stadium’s place. Included was a section of the Yankee Stadium facade; when the Stadium was refurbished during the 1974 and 1975 seasons, most of the old facade, which stretched about three-quarters around the park, was torn down and only two short sections, or new short sections, replaced it. The New Yankee Stadium opened with a 10-2 loss to the Cleveland Indians in April 2009; indeed, the Indians walloped the Yankees with a 22-run onslaught the same week. However, just like in 1923 the Yankees inaugurated their new stadium with a World Series victory later that year, just in time for longtime owner George Steinbrenner to see one more championship. Oddly, I haven’t seen a game yet at the new park, though I have toured the clubhouse and sat in the dugout. At the old Stadium I saw a no-hitter by Jim Abbott, who was born with one hand, in 1993, and in 2008 I saw Mike Mussina win #19 in what would be a 20-win season, the last season of his career.